This playdough recipe is based on berries. It could be Cranberries, Strawberries, Blueberries or whatever berries you prefer. Just make sure you don’t use a square blackberry. 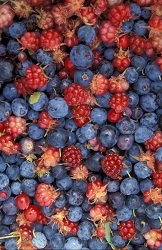 Boil the berries in 3-4 cups of water until they open up and color the water. Pour two cups of the water through a strainer to remove any berries. Allow the water to cool a bit. Combine the dry ingredients in a non-stick pan. Then add the water and oil. While still stiring, cook the mixture on medium heat until a ball forms. It should take approximately 4 minutes. Place the dough on a lightly floured board and let it cool some more. This is probably one of our most complicated playdough recipes, when it comes to steps included in making it. Fear not though, it only seems more complicated than it is. Just follow our instructions and it will work like a charm. This us fin for kids to play with and delicious to eat!!! I would discourage kids from eating this! Most probably wouldn’t want to do more than taste it but, if they did actually eat it, they would probably vomit, because of the high salt content. Just to get an idea, if you were baking some kind of bread with flour, you probably wouldn’t use more than one teaspoon of salt to two cups of flour. This recipe calls for a cup of salt, or 48 teaspoons! Definitely not meant for eating! Uk Guidelines state that it’s not recommended for under 5s have any salt in their diet at all! Can the berry play dough be baked to preserve handprints? I would think so, but I honestly haven’t tried. Please let us know if you give it a go. I know both of my boys would enjoy doing something like this. They love to caetre especially when they can make it look however they want too. is this going to make stains on children when they use?